Japan’s biggest law firm, Nishimura & Asahi is also the only Japanese firm in the GAR 100. It was established in 1966 and has been involved in a number of arbitrations over the years, spanning M&A, joint ventures and construction. With Japan only recently beginning to make progress as an arbitral seat, the firm’s activities in this field haven’t been as visible as those of its counterparts in, for example, South Korea. But the work is there. It’s been active in disputes across Asia, taking on cases at major institutions like the ICC, SIAC and CIETAC, as well as the Japan Commercial Arbitration Association (JCAA), the Korean Commercial Arbitration Board (KCAB) and other recognised bodies in Indonesia, Vietnam and Thailand. In 2010, it caught a lot of notice for winning a pro-New York Convention ruling in the Tokyo courts for insurance company AIU during set-aside proceedings; the case was shortlisted for a GAR award. The practice is led by Tokyo partner Hiroyuki Tezuka, who is a familiar face around the region – he sits on the SIAC Court and the KCAB international arbitration committee, as well as the ICC Court. He is the only Japanese lawyer to feature in Who’s Who Legal’s list of Thought Leaders in international arbitration. The team also includes partner Chie Nakahara; English-qualified foreign attorney Natalie Yap, who joined from Watson Farley Williams in Singapore; and partner Lars Markert, a recent arrival from Gleiss Lutz in Stuttgart. Another name to know is Singapore partner Shintaro Uno who has been helping the firm branch out into Singaporean and Indonesian arbitrations, particularly construction-related cases. Uno also sits as arbitrator. In New York, there is counsel Azusa Saito who relocated there from Tokyo. The firm has offices in four Japanese cities and 11 overseas offices, including in Beijing, Shanghai, Hanoi, Ho Chi Minh City, Hong Kong, Jakarta, Yangon, Bangkok, Dubai and New York. Major clients include Novartis, Mitsubishi Fuso Truck and Bus, and Honda Motors. A Japanese automotive company used the firm to good effect in a US$300 million dispute with a former Asian distributor. The firm obtained an anti-suit injunction in 2017 from a JCAA tribunal made up of three well-known arbitrators, then went on to prevail in the arbitration in the following year. The client was granted the declaratory relief it asked for along with over US$3 million in costs. As mentioned, Lars Markert joined the firm in 2018 from Gleiss Lutz. He had previously spent two years on secondment at Nishimura. He has experience in commercial and investment-treaty arbitration and also sits as arbitrator. In 2018, the firm successfully defended a Japanese automotive client in a US$70 million JCAA case brought by a former distributor in the Middle East. Herbert Smith Freehills in Tokyo was on the other side. Together with a UK firm, Nishimura & Asahi helped a large Japanese corporation secure the dismissal of a US$175 million claim relating to the termination of a distribution agreement. With Lars Markert, while he was still at Gleiss Lutz, the firm helped a Japanese pharmaceutical company settle an ICC case with a Danish pharmaceutical company on favourable terms. Nishimura & Asahi is a leading Japanese law firm, covering all aspects of domestic and international business and corporate activity. We pride ourselves on being a pioneer at the forefront of creating innovative solutions for resolving disputes in Japan and elsewhere. Our achievements in large and complex disputes in respect of a wide variety of industries and practice areas is unrivaled. This has been made possible by the advantages arising from our scale, as the largest international law firm headquartered in Japan, and the comprehensive range of services we are able to offer. 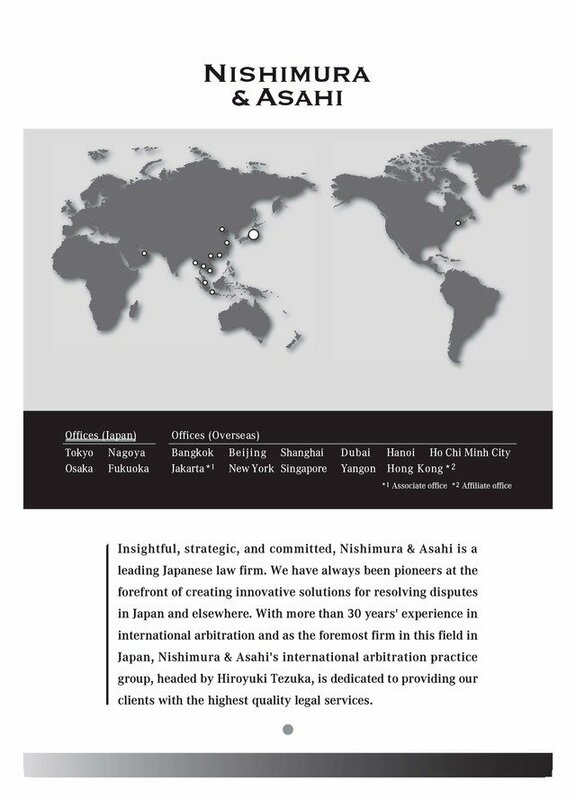 With more than 30 years’ experience in the field, our international arbitration practice group, headed by Hiroyuki Tezuka, is dedicated to providing our clients with the highest quality services for dispute resolution. We have been involved in high-profile and large-scale arbitrations under various institutional rules, such as those of the ICC, SIAC, JCAA, AAA-ICDR, KCAB and VIAC, and are also experienced in ad hoc arbitrations. Our arbitration practice group has experience handling arbitrations relating to post M&A disputes, joint ventures, licenses, distributorships, franchises, construction and infrastructure projects, foreign investments and investor-state disputes, and intellectual property. We are Japan’s first and only law firm to be listed in the “GAR 100”. With the continued expansion of our international presence and clientele, we have overseas offices in Bangkok, Beijing, Shanghai, Dubai, Hanoi, Ho Chi Minh City, Jakarta*1, New York, Singapore, Yangon and Hong Kong*2, and domestic offices in Tokyo, Nagoya, Osaka, and Fukuoka. Through our domestic and global network, we are ideally placed to provide our clients with a borderless one-stop service, from Japan to the world.